Organic electronics have gained rapid acceptance in the electronic display industry due to their low cost and ultra-thin, flexible form factor. Organic technology can also be applied to solar photovoltaics to completely redefine the way solar cells are fabricated and how and where solar power is used. NanoFlex has developed the most extensive patent portfolio of small molecule organic photovoltaic, or OPV, technologies in the world. We believe that our intellectual property positions us as a gatekeeper for the future of the solar industry. Organic semiconductors are carbon-rich compounds with a structure tailored to optimize a particular function, such as responsiveness to a particular range of visible light. The use of organic compounds as semiconductors for commercial applications is relatively new. Organic semiconductors have elicited intense interest globally as they hold the promise of ultra-low cost and high performance along with a host of break-through new properties that unlock exciting new product opportunities in electronics, lighting, and photovoltaics. Organic photovoltaics offer a number of advantages ranging from rapid, ultra-low-cost manufacturing to extremely thin, lightweight, and flexible form factors, which present opportunities for revolutionary advances in the acceptance and deployment of solar energy. There is no restriction on the size and shape of OPV devices, and every conceivable shape and form can be envisioned, with only human synthetic capability as the limiting factor. The devices can be in the form of fibers, woven to fabrics, bent or rolled as films on curved surface. The near two-dimensional nature of OPVs will present a substantial paradigm shift and it may take some time before it is accepted by the mass market. 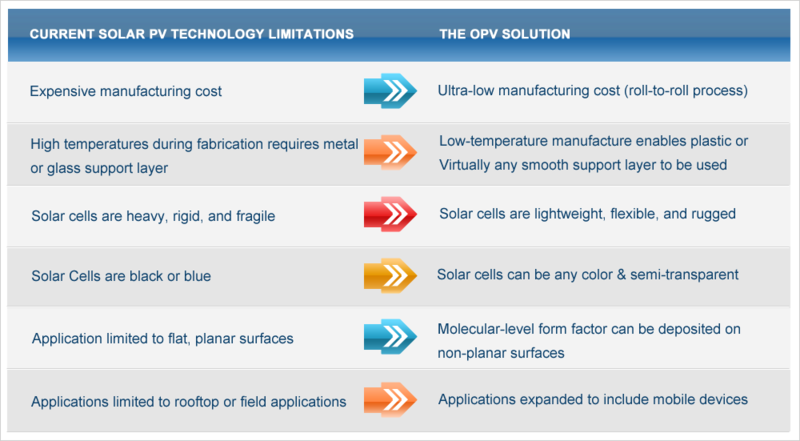 Check out the table below to see more advantages of OPVs. A "small molecule" solar cell consists of a series of very thin vapor deposited organic layers sandwiched between two electrodes, a transparent anode (Indium Tin Oxide) and a metallic cathode on top. Two types of electrodes are used -- an extremely layer of indium tin oxide (because it has to be optically transparent), is used as an anode. Low work-function metals such as magnesium, lithium, and their alloys with silver and aluminum are now used as cathodes. While there is no restriction on the size and shape of OPV devices, and every conceivable shape and form can be envisioned, only human synthetic capability is the limiting factor. The devices can be in the form of fibers, woven to fabrics, bent or rolled as films on curved surface. The near two dimensional nature of OPVs will represent a new paradigm shift and it may take some time before it is accepted by the mass market. Play the video to see the inner workings of an organic solar cell. An organic solar cell consists of a series of very thin vapor or solution deposited organic layers sandwiched between two electrodes. 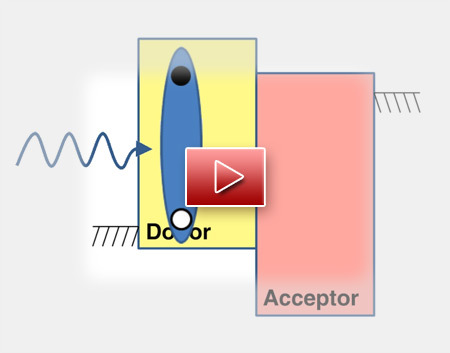 The basic mechanism of photocurrent generation in OPVs can be illustrated with two organic materials, one a net electron donor (D) and the other an acceptor (A). After the hole and electron are generated, they are conducted through the D and A materials and extracted by the electrodes (charge collection). Once charges reach the electrode and are extracted and transferred to the outer circuit, the electron is transferred to the cathode and the hole to the anode. NanoFlex's OPV technology platform is based on flexible, thin-film organic technologies that it has researched and developed over the last two decades. NanoFlex's approach has been to advance all dimensions of OPV technology, including the development of new materials (some of which are now being sold in small quantities by materials suppliers), new high efficiency device architectures, and ultra-high-speed, energy efficient production processes such as organic vapor phase deposition developed in our research partner's laboratories, and solar cell modulization. NanoFlex's 20 year research partners at the University of Southern California and the University of Michigan are leaders in the field of organic electronics, including organic light emitting diodes, or OLEDs, and OPV.